Ducati Team factory rider Andrea Dovizioso took a second-place finish in today’s Aragon Grand Prix after a thrilling battle with the eventual race winner Marc Marquez. Powering away well from the front row, the Italian rider emerged from the first-corner melee in the lead and he stayed there until lap 13, always followed closely by his Honda rival, who then passed him on the next lap. 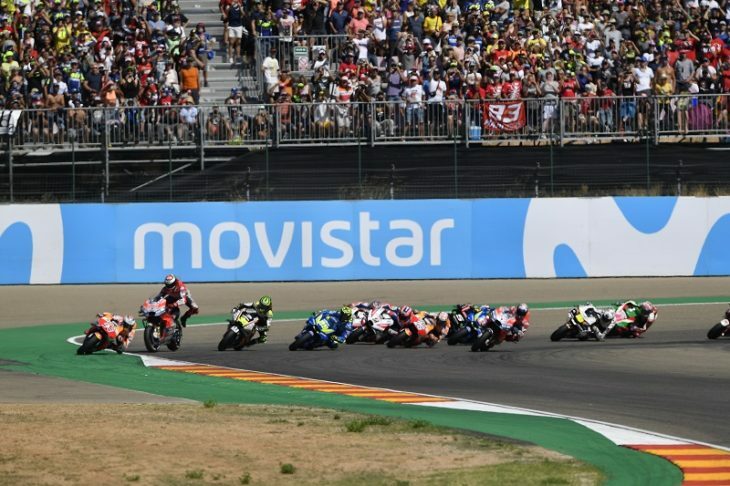 After grabbing back the lead on lap 16, Andrea tried his best to defend himself from Marquez but he was eventually passed by the Spanish rider three laps from the end and he crossed the line just 0.648s behind the winner. It was a distinctly unlucky race for Jorge Lorenzo, who started from pole position. The Mallorcan rider went wide under braking for the first corner, ending up on the dirty part, and he lost the rear of his Desmosedici GP, crashing heavily after a highside. After getting up on his feet again but limping, Jorge was taken to the circuit Medical Centre where he was diagnosed as having a dislocated big right toe and a compound fracture of his second metatarsal. The doctors immediately put Lorenzo’s right foot in a cast but they expressed confidence that he can be ready to race in the upcoming Grand Prix of Thailand, scheduled for the Buriram circuit from 5-7 October. The championship positions remain unchanged, with Dovizioso second and Lorenzo fourth in the Riders’ standings, and Ducati second in the Manufacturers’ battle.